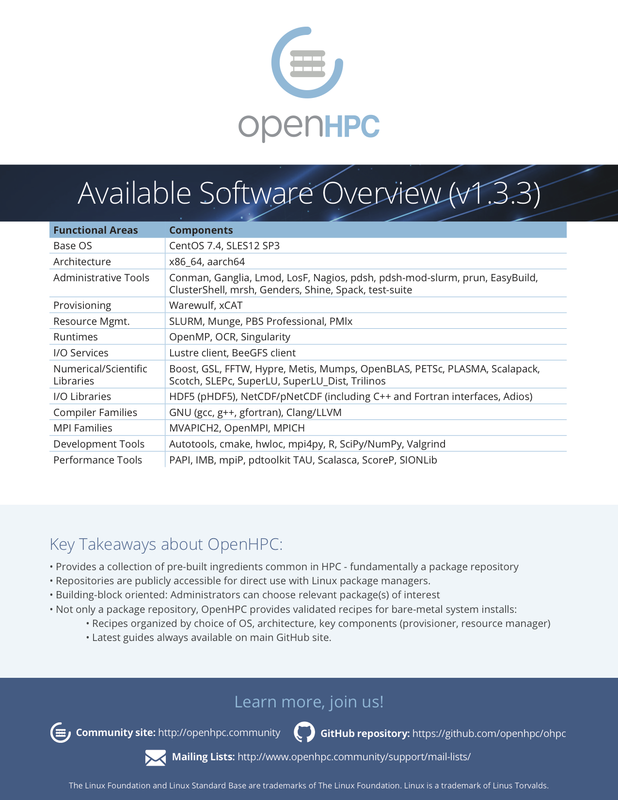 We are pleased to announce the release of OpenHPC, v1.3.3. This is an update release for the OHPC 1.3.x branch targeting support for CentOS 7.4 and SLES12SP3. This update release provides a number of component updates along with two new additions (mpi4py and pmix). This release also introduces a new compiler toochain (llvm5) and MPI toolchain (openmpi3). At this BoF, speakers from the OpenHPC Technical Steering Committee will provide a technical overview of the project and near-term roadmaps. We then invite open discussion giving attendees an opportunity to provide feedback on current conventions, packaging, request additional components and configurations, and discuss general future trends. We are pleased to announce the release of OpenHPC, v1.3.2. This is an update release against OHPC 1.3 that provides a number of component updates along with several new additions (e.g. cmake, plasma, pnetcdf, scotch, and slepc). This release also introduces a new llvm4 toolchain. The OpenHPC Technical Steering Committee has selected Karl W. Schulz to serve as the Technical Project Lead. Dr. Schulz has served in this role since the project was formed. Please join us in congratulating Karl! 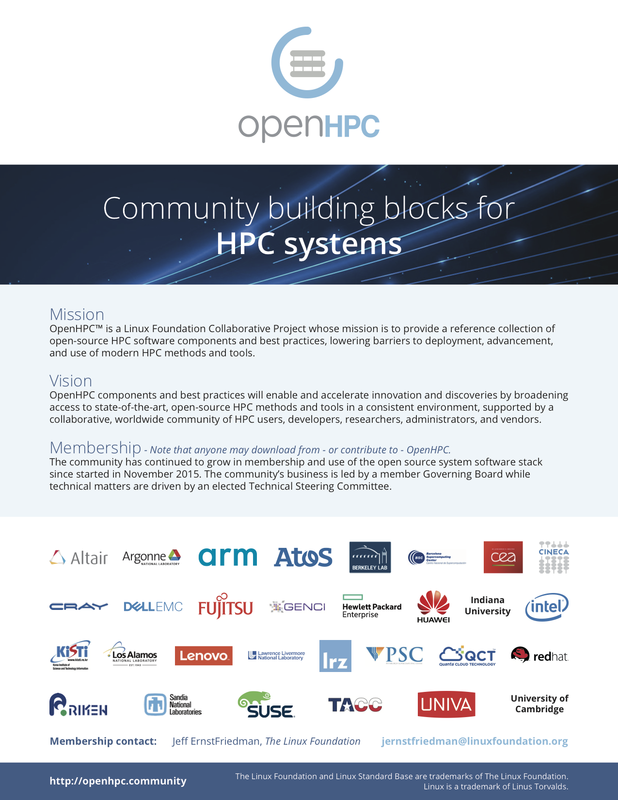 OpenHPC is pleased to announce the formation of the 2017-18 Technical Steering Committee. Join us in congratulating this year’s participants. Join OpenHPC Technical Steering Committee members on a walk through of Getting Started With OpenHPC at PEARC17. We are pleased to announce the release of OpenHPC, v1.2.1. This is an update release against OHPC 1.2 that provides a small number of fixes and minor component changes. Users who previously enabled the OHPC 1.2 repository via the ohpc-release package will have access to the updates available in 1.2.1 and no additional repository enablement should be necessary. The OpenHPC Technical Steering Committee adjourned its regular meetings for the remainder of the calendar year. We would like to thank the entire community for the success of this project and in particular thank the volunteer contributors to the Technical Steering Committee.